You can use effective interest rate to compare various hire purchase/ lease offer. It can even compare loan with same quoted flat rate but with variation of making final instalments upfront. You can use effective interest to compare with other interest rates like housing loan interest rates or fixed deposit rates, etc. You can download this Hire Purchase Calculator here. Should you get a hire purchase loan or use the extra money you kept in your flexi-housing loan to pay for your new car? It can be confusing. It is difficult to know the true interest cost of your hire purchase (or lease) because the interest rate is quoted in flat rate. This flat rate is not comparable with the interest rate we usually use for fixed deposit or housing loan. For instance, a flat rate of 3.5% for a 5-year hire purchase is equivalent to effective interest rate of 7.56%. We cannot use the flat rate 3.5% to do any comparison. However, can use this 7.56% interest rate to compare with housing loan rate of 4.25% or fixed deposit rate of 3.25%. A 3.5% flat rate of car hire purchase loan is MORE expensive than your 4.25% housing loan rate. 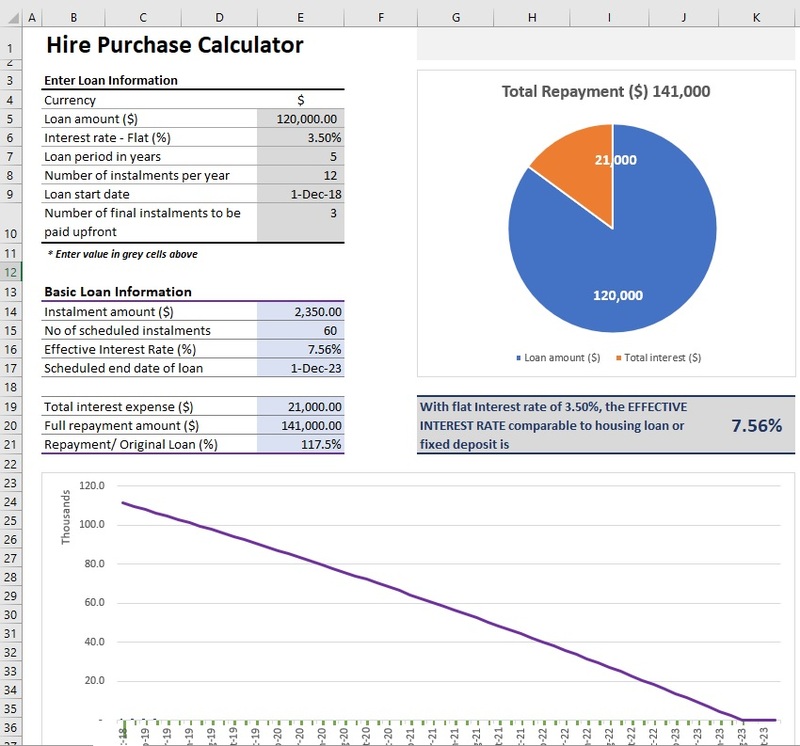 This useful hire purchase calculator helps you to calculate the effective interest rate based on flat interest rate quoted in hire purchase or lease. Enter value to the grey color cells. 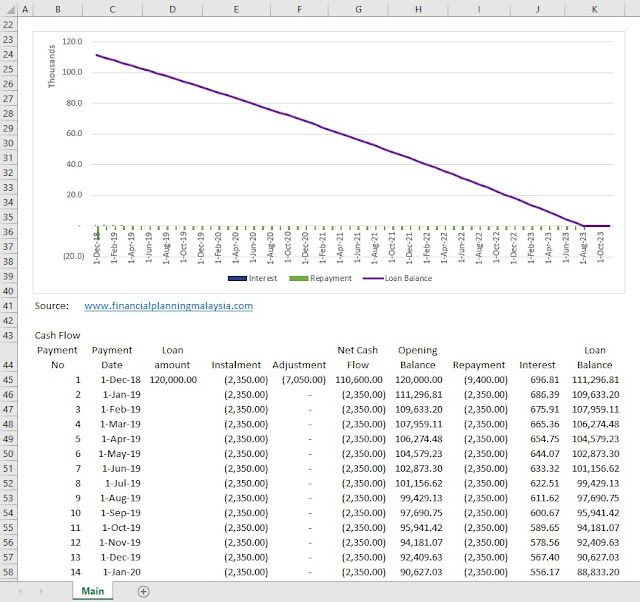 This calculator calculate total interest cost, installment amount, total repayment amount, and effective interest rate. It allows you to compare various HP or lease offers and even with housing loan. This calculator generate repayment timetable with specific dates. With repayment schedule you can know the amount of early repayment and the last instalment. This calculator can be used to calculate leasing or hire purchase loan of your business equipment too. Some leasing companies offer lease agreements that require you to pay your final instalment(s) upfront. Such arrangement increases your actual effective interest rate despite that the quoted flat rate remain the same. This calculator includes such factor to generate accurate effective interest rate. You may download this Hire Purchase Calculator here. How to Actually Save Money? How to actually save money? It is not about packing your own lunch. This article and video from Motley Fool stated that we simply need to focus on our three biggest expenses in our life, i.e. house, car and education. While I agree with the author, there are variations for Malaysians. Here is the article from Motley Fool on How to Actually Save Money Below is the video from the same article. Clear understanding of what is a good enough house for your family. Make careful decision based on affordability of house/ apartment, size, amenities and location, and its potential to increase in value over the years. Finding an affordable house that will increase in value over time is important. It will help to fund your next bigger house. When you retire your children left home and you can sell the house and move to a smaller condominium. The extra money funds your retirement. Always compare your home loan interest rate with the market rate. Negotiate with your bank periodically. Use Flexi Home Loan, so that when you have extra money you can pay down extra loan amount to reduce interest cost or shorten loan tenure. When you need money, you can also withdraw the extra loan payments you made to the Flexi Home Loan account. So instead of keeping fixed deposit which gives you 2%-3% interest income, keep this money in your Flexi Home Loan account to reduce your interest expenses which is at around 4.4%-5.5%. Local public or semi government funded universities (around MYR50,000 for entire 4 year course) vs overseas universities (minimum MYR400,000 to study 3 year in UK). For courses like accountancy, students can even study and take the overseas professional exam in Malaysia. Low education fees means you can free yourself from the financial slavery of student loan or save your parents' retirement fund. It bothers me when I read a financial blog "frugal for life". It is a blog dedicated entirely to living a frugal and simple life. I agree living frugally. I always believe we don't need to spend (or spend only minimal) to live to the fullest. However, I disagree to make frugal an objective of life. For instance, I will not disagree a statement like this "Live to the fullest without spending much". It is still about being frugal, but only as a means to the objective of living to the fullest. There is a major difference between "buy cheap things" and "buying quality things cheap". I agree with the blogger's message, though not her emphasis on FRUGAL instead of satisfaction of life (frugally). It will be better if it is about prosper for life without waste. Depending on your lifestyle you can save quite a fair bit from your daily food. 2. Call your mother and ask her for some good recipes. Cook at home. Spend the later part of your evening play with your computer and/ or children. 3. Stay with your parents or parents in law or invite your parents or parents in law to stay with you. Depending on your family, this can be one of the biggest saving opportunities. 4. Are you too used to have your lunch at expensive outlet with your colleague? A quick reminder here, take-away mixed rice lunch is usually less than RM5. What about packed lunch from home? 5. Meeting your friends for dinner? Such outing usually ends up at expensive restaurant. Tell your friends you are on budget. There is nothing to be ashamed of. (I can be more blunt, I told some of my friends that I simply hate expensive restaurant. I will join them after their expensive meal.) A better idea is to schedule a gathering after dinner at mamak store. 6. Do away with beers, cigarette and pubs. Stay at home with your family or go out with your friends to mamak store. If you are surrounded by friends that drink beers, smoke and go pubs and you are financially strained due to such habits. You are probably with the wrong company. :-) Join another group of friends. 7. Find a place for good coffee at good price, instead of drinking Starbuck's cafe latte. There are things in life that you should not buy new. These are 10 of them among all. By Liz Pulliam Weston. Read the original article on why you should not buy these items new and how to save money from buying second hand with bargain, sharing, renting, etc.